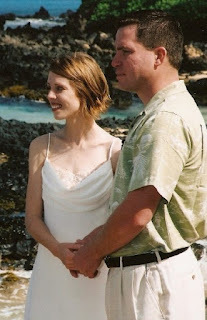 Ten years ago today, Steve and I were exchanging I do's on a beach in Maui. I'd spent about six months planning our trip. I found us a condo overlooking the mountains in Lahaina. Our accommodations were the only ones located directly on the beach and also walking distance to a smorgasbord of gift shops, art galleries and restaurants. Although I looked forward to enjoying the tropical breezes and picturesque beaches, I planned to pack in as many activities as we could during our seven day stay. I admit I was less than thrilled about Steve's insistence of doing a 3/4 day, deep sea fishing excursion. But, I agreed to go since he had gone to the trouble of losing 20+ lbs. in order to meet the weight requirement to ride horses with me. As it turned out, the fishing trip was a total blast -- our crew fought, but later lost the battle with a 500 lb. female Marlin; while our horseback riding activity was uncomfortable and mildly unnerving as the horses refused to obey our commands. We made it a point to enjoy fresh fish every day...sometimes even for breakfast! We took pleasure in a chocolate and champagne sunset sail and a traditional luau. Later in the week, in exchange for listening to a time share spiel, we got a real bird's eye view of the Haleakala craters, the Seven Sacred Pools, and the world famous Ho'okipa windsurfing beach from the seat of a helicopter. While perusing the shops, Steve, who didn't want a ring, suddenly got all traditional on me and bought a $30 silver band for our big day. As we passed a hair salon, I had the urge for a change and so the day before our wedding, allowed a stylist, who spoke very little English, to lop off 5+ inches of my hair, in favor of a trendy 'do. The morning of our wedding day we met our minister and photographer - a husband and wife team, at Makena Cove Beach. The minute we stepped onto the sand, we were greeted by two very territorial pit bulls. In an effort to shoo them away, Steve and our minister, Dennis, shouted and kicked sand as the dogs barked and snapped. I stood frozen and worried we'd all end up in an emergency room. Thankfully, the dogs finally gave up and ran off. We all breathed a sigh and took to the beach. While our photographer, Genevieve, began setting up her equipment, Dennis, a native Hawaiian, took a moment to chat with us and asked whether we'd prefer a traditional ceremony or one that incorporated Hawaiian chants. We chose the latter. Just then I noticed a small sign posted that read, "No Weddings Allowed". Dennis told us not to worry because all Hawaiian beaches are public property and he had married hundreds of couples in the very spot we now stood. By this time, Genevieve was ready and so was I. However, as Steve and I gazed into each other's eyes with a heavenly landscape as our backdrop, we were suddenly accosted by a shower of sprinklers. And then, a barrage of obscenities, as an elderly gentleman dressed in shorts and a t-shirt with muscles silk-screened across the chest, launched on us much like the pit bulls did earlier. After a heated exchange, in which our uninvited guest tossed out racial slurs like daggers, our minister responded by pitching the garden sprinklers out of range. The man stormed off and shouted threats of calling the police. At this point, Dennis turned to me and asked, "What do you want to do?" My response was immediate and unwavering, "I want to get married!" So, with the angry man gone and the sprinklers off, Steve and I got hitched. Though after the ceremony we were introduced to the Maui Police Department. After taking our statements, we learned that Dennis was right - the beach was public and not only that, by calling the police, the gentleman, inadvertently tipped them off to an illegal bed and breakfast he was running out of his own home! Sometimes Karma works really fast. I will go through the motions. I will look past his outdated wardrobe. I will accept he is being sincere. I will enjoy the show. I will go out to dinner. See, you've been having these great stories way before your two kids arrived--it's in their gene pool! Awww. So sweet. Whoever set you two up, sure knew what they were doing. What an amazing wedding story! Your hair looks adorable. :) Happy 10th anniversary! Thank you! Thanks for stopping in.